Israeli soldiers abducted, Tuesday, three Palestinians in occupied Jerusalem, including one who was kidnapped by undercover soldiers in the Al-Aqsa Mosque, and one at a military roadblock near Jenin, in northern West Bank. 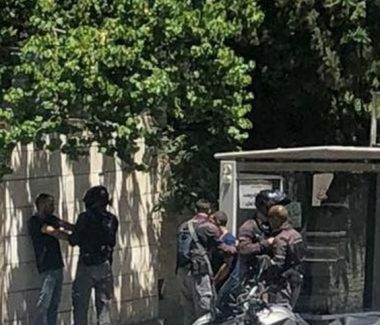 Media sources in occupied Jerusalem said several army jeeps invaded the al- ‘Isawiya town, in the center of the city, and abducted Sa’ed ‘Obeid, and Sbeih Abu Sbeih, before taking them to an interrogation center in the city. It is worth mentioning that Sbeih is the son of Misbah Abu Sbeih, 39, who was killed by Israeli fire on October 9, 2016, after he shot to death an Israeli woman and a police officer near light-rail station at Jerusalem’s Ammunition Hill. In addition, undercover Israeli soldiers infiltrated the courtyards of the Al-Aqsa Mosque, in Jerusalem, and kidnapped a worshiper, who remained unidentified at the time of this report. Eyewitnesses said many soldiers also invaded the mosque before searching and interrogating dozens of young men. The attack came after dozens of colonialist settlers invaded the mosque’s courtyards accompanied by police officers and soldiers, and conducted provocative tours. Furthermore, the soldiers abducted a young man, identified as Hazem al-Ajlouni, from Kafr Aqab neighborhood, north of Jerusalem. In related news, soldiers stationed at Za’tara military roadblock, south of the northern West Bank city of Jenin, abducted a young man, identified as Watheq Mohammad Omar, from the al-Yamoun nearby town. On Tuesday at dawn, the soldiers abducted eighteen Palestinians, including one woman, in several parts of the occupied West Bank, including Jerusalem.